“Americans put their faith in the transportation system every day to move about our great country in pursuit of economic opportunity, friendship and adventure, and should always travel knowing our systems will be safe and secure,” Bilello said. Tampa—November 3, 2017—Michael Bilello, who served as Centurion Strategies’ founder and CEO since the launch of the public relations, marketing and crisis management agency, will be departing the firm to accept a role with the Department of Homeland Security. 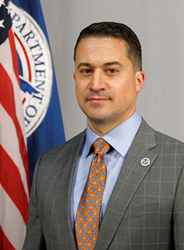 He will serve as the TSA’s Assistant Administrator of Strategic Communications and Public Affairs. “Americans put their faith in the transportation system every day to move about our great country in pursuit of economic opportunity, friendship and adventure, and should always travel knowing our systems will be safe and secure,” Bilello said. “To help communicate this vital message and share the unwavering commitment of our dedicated public servants who make it possible will be a tremendous honor. I am excited to serve this great country again, bringing forward all of my professional experiences to support the missions of the Department of Homeland Security and TSA,” he added. Bilello graduated from Florida State University in 2001 with several honors, became a U.S. Marine officer and served during the initial phase of Operation Iraqi Freedom. Following his honorable discharge in 2004, Bilello worked for MWW Group in Los Angeles. In 2008, Bilello started Centurion Strategies with three hundred and fifty dollars and built it into a million-dollar, award-winning agency that has served such consumer brands as Kona Grill, Identity Stronghold, Scrub Daddy, Orthodontic Specialists of Florida, and Carrier, as well as a long list of Hall of Fame, Pro Bowl and Super Bowl Champion NFL clients. He was named to PR Week’s “40 Under 40” in 2009 at the age of 28. Centurion will continue to serve clients absent his active involvement due to the requirements and restrictions of this appointment.